Every year I add journals to my Christmas list and every Christmas I am given several. Among the ones I was given this year was one that had a pre-printed title on the cover that reads, "All you need is ignorance and confidence and the success is sure." Mark Twain. Mmmm....this makes me think my success might be sure? 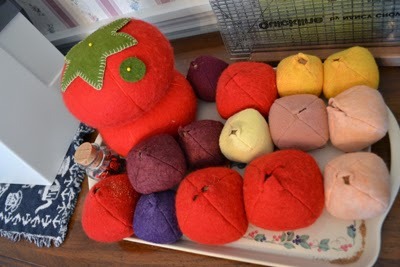 But then again is it out of ignorance that I operate the way I do, cutting out multiple projects at once before I have so much as sewn one to see if I can do it? Most would look at what I have cut and assume that I have confidence in my sewing abilities but here is the rub, I wasn't brought up ignorant nor am I confident about my abilities either!! Only days before returning to college one year, I set out to buy myself a rug for my college dormitory room, only to find that I couldn't afford one. My determination to have a rug was not dashed however, and I proceeded to ask carpet stores for their carpet scraps and returned home with a car full, along with a package of very large curved needles and some heavy duty string. Fortunately for me I had a talented mother and friend to help me figure out how to stitch these carpet scraps together to make a beautiful scrap rug. It was no small feat. With blistered hands my girlfriend and I returned to school and much to everyone's amazement, with the help of my recruited volunteers, I had a huge big rug that covered my dorm room for only a few dollars! "Need is the mother of invention" I learned and later it switched to "want and lack of money" that became my driving force. The lack of common sense seems to be a God-given in my case. 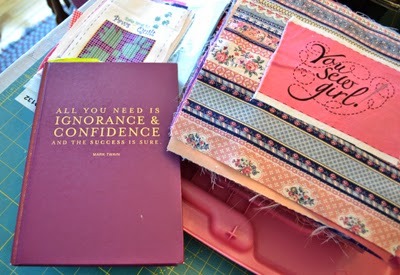 And so it is that in the months I have used this journal, I have set a record for the number of quilts, fleece socks, wool pincushions and other craft items I have cut out, only to now question whether or not I really have the skill, ability, and stamina to stitch them all. 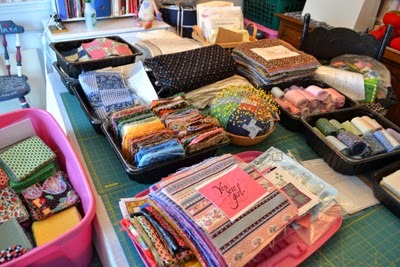 Need and want are there, as I prepare to sew for my holiday craft sales and special hand-made gifts for friends and family, but it has been a long while since I have tackled a challenge of this scale. I have literally "cut out" years worth of sewing for myself! I am counting on Mark Twain's quote being accurate despite having been brought up to "know better". I will have to ingest large doses of "confidence and courage" tomorrow and in the days ahead to"take-on" this massive sewing feat, and begin my sewing marathon! Time for doning a pair of my special fleece socks as on their tag it says that they are Great Feet for Great Feats. I should also take bets as to whether or not I can do IT and run a lottery regarding the number of items I can finish before Christmas! Mind you, IT is too scary to detail until I can scratch some off this list!. 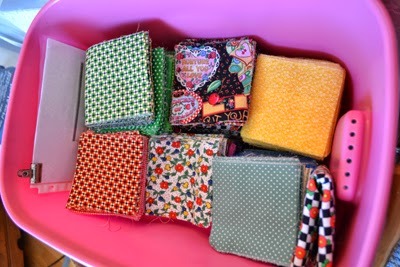 I usually work best under pressure and I've heaped on lots by the sheer numbers of what I have cut out for myself! I recently told my daughter that "I am committed" and she smiled and agreed but something tells me that she didn't understand my use of the word committed, when she turned to my husband and asked if he had heard my statement. I will keep you, my readers informed if my address changes soon! My confidential confession to my readers: My name is Jane McMillen and I am my parent's "fruit loop" and this is only one of my personal "fruit loop" stories! I would be comforted to know if any of you are "fruit loops" like myself?